Galton was elected to the club, which had a literary-scientific reputation, in 1855. Other members included Dickens and Charles Darwin. 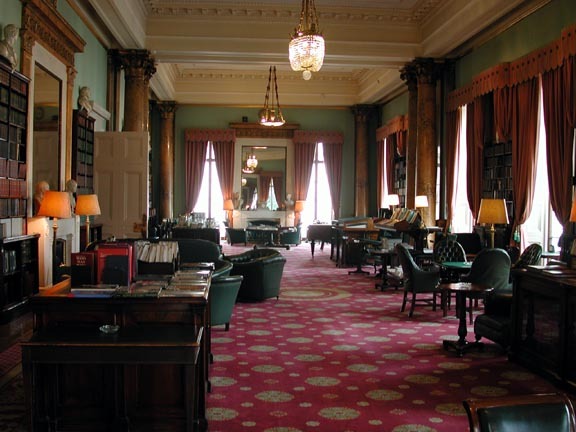 The South Library of the Athenaeum Club, Pall Mall, London. 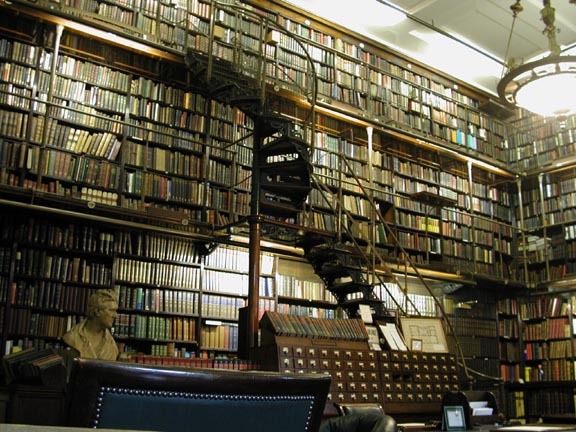 Galton made extensive use of the library. 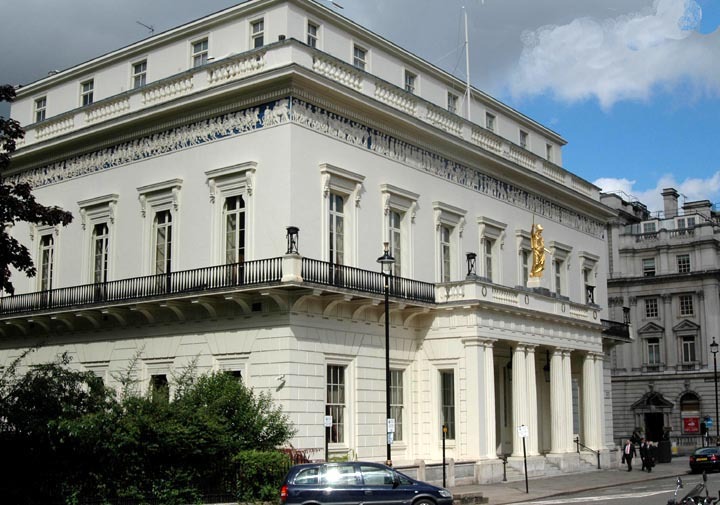 The Athenaeum Club, Pall Mall, London. 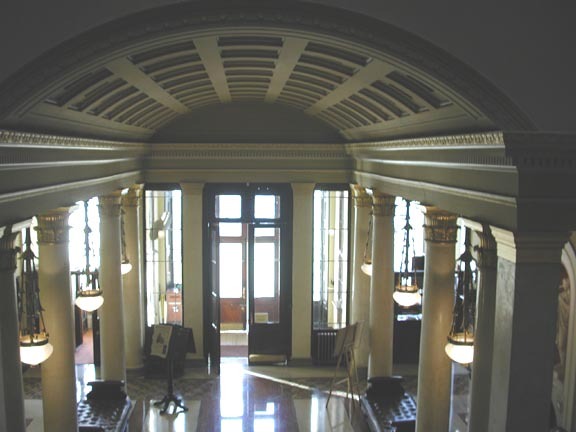 The building was designed by Decimus Burton in 1824. 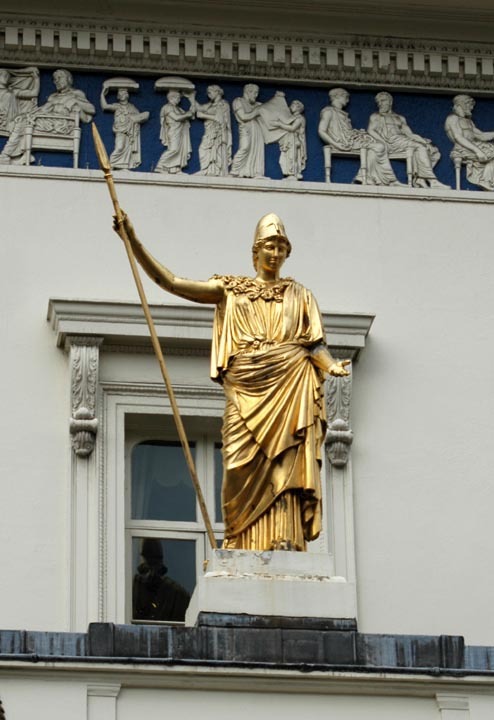 Athena, exterior of the The Athenaeum Club, Pall Mall, London. Exterior of the Athenaeum Club from the Crimean War Monument. Plaque outside 42 Rutland Gate. The Nature and Nurture of Rectangles. A note on an elementary but pervasive fallacy in discussions of heritability. Francis Galton in Mind of Byron: Down the Danube to Constantinople in the manner of those adventurous uncles, Theodore Galton and Sir Francis Sacheverell Darwin, reconstructed from letters, diaries and other authentic evidence. First draft, part of a work in progress. We must know. We will know A review of two new books on behavior genetics and heredity, by Robert Plomin and Kevin Mitchell. Francis Galton and Alphonse de Candolle: Notes and Correspondence edited by Gavan Tredoux (galton.org, 2018). First draft, being part 6 of a work in progress. Francis Galton on Mars: the Discontinuous Variation Notebook edited by Gavan Tredoux (galton.org, 2018). Among the Galton papers, housed in the Special Collections Department of University College London, many notebooks survive, recording his explorations of things that amused him or took his fancy. Much of this material never saw print. The pages teem with ideas, often skipping around without warning. One of these notebooks is titled 'Discontinuous Variation: 1896-7'. The first page leads with 'Clear mind from cant' and contains ruminations about moral philosophy and religion. 'Ideals may well be elusive'. Several of the subsequent pages reflect the title, dealing with the ways in which change in a continuous characteristic can eventually produce a discontinuity, so that a different class is called for. By the twenty-second page, the subject has jumped to free will, a recurring theme for Galton, prompted by his researches into heredity. Three pages later, the subject switches abruptly to an encoding scheme for representing mathematical operations. Seventeen pages of rough notes follow, in which the scope of the encoding expands to include instructions for reproducing pictures. Encoding of pictures forms a link to 'Discontinuous variation', since at a certain point a series of dots is perceived as a line. On the forty-second page of the notebook, Galton lays out the skeleton of a story involving Mars, sun signals flashed from Earth, and eugenics among intelligent Martians, who are said to be descended from Ants by natural and artificial selection. This is a sample from a larger work in progress, of which the following volumes are complete. Francis Galton at Cambridge: Letters and Diaries, 1840-1844. 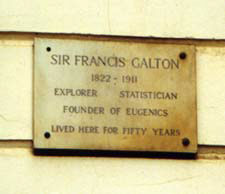 Francis Galton in Africa: 1850-1852. The Diary of Charles John Andersson: 1850-1851. My book on the eminent geneticist, and quondam Galtonian, JBS Haldane, was issued by Encounter Books in April 2018. Comrade Haldane is too busy to go on holiday: JBS Haldane, Communism and Espionage. Based on the VENONA intercepts, the MI5 files and the Haldane Papers at UCL. Major site redesign to support mobile devices. Many other minor warts were removed in the process. JBS Haldane was a Galtonian for at least part of his influential career. See my latest project at JBS Haldane FRS 1892-1964 for a full bibliography and many facsimiles of his works. I have also completed a book on Haldane which will be published there soon. Three new articles on Galton and George Darwin by Chris Pritchard. See scholarship. 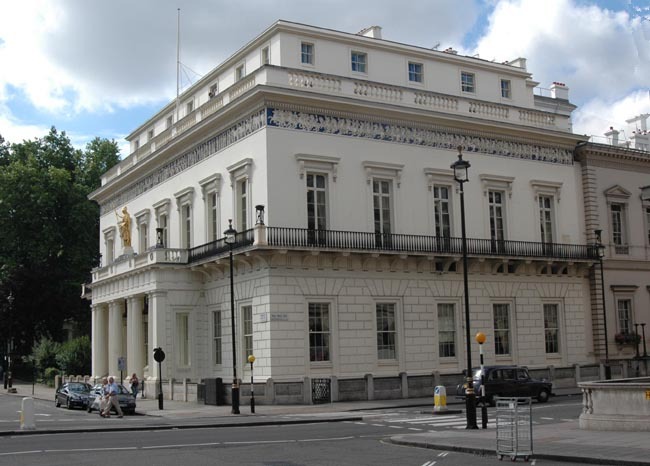 Just published: a reanalysis of fraud charges levelled at the noted Galtonian Sir Cyril Burt. Intelligence Volume 49, March-April 2015, Pages 32-43. From the abstract: "In the last comprehensive review by Mackintosh et al. Cyril Burt, Fraud or Framed? 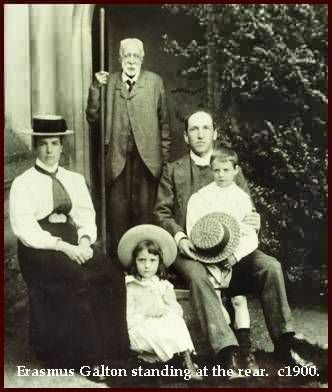 (London: Oxford University Press, 1995) of the fraud charges posthumously leveled against the once eminent psychologist Sir Cyril Burt, Mackintosh and Mascie-Taylor asserted that statistical anomalies they detected in his social mobility data of 1961 provided crucial evidence of guilt. The anomalies included apparent departures from normality in some parts of the data, incommensurate cell totals, and suspicious uniformity within IQ bands across fathers and sons. It is shown here that the departures from normality were a natural consequence of unavoidable rounding when inverting the cumulative normal distribution to construct the class IQ bands used in the tables. Elementary procedures are given, known since at least the 1930s, which could have been used by Burt to simultaneously preserve both the normality of his IQ data and the desired population proportions of occupational classes. Other anomalies first noticed by the statistician Donald Rubin are explainable as artifacts produced by fixing marginal totals in the presence of rounding to IQ scores, then using the same weighting procedures to conform to margins. The grounds given by Mackintosh and Mascie-Taylor for finding fraud in Burt's social mobility data are therefore dismissed." Added "Chance and its Bearing in Heredity" from the Birmingham Daily Mail (1886/12/07). Added the newly discovered letter "On the reported current in the Suez Canal" from Nature 1870/07/07: 189. Added the newly discovered letter "Geographical Prizes" from Nature 1870/07/14: 210. Added the previously undiscovered book review of Étude sur la Dégénerescence Physiologique des Peuples Civilisés by Par M. Tschouriloff, from Nature 1877/03/08: 396. Added the previously undiscovered book review of Georg Mayr Die Naturkräfte from Nature 1877/10/11: 500. Added the previously undiscovered scathing book review of J. M. Guyay Education and Heredity from Nature 1891-07-30: 292-3. "As a contribution to science the book cannot be recommended. Whether it has a theological value, we must leave for others to say." Added the previously unknown item "Weather Maps" from the Proceedings of the British Meteorological Society (1: June, 1862): 203-4. Added the long-sought-after item "Meteorological instructions for the use of inexperienced Observers resident abroad", from the Proceedings of the British Meteorological Society (1: June 1863): 397-400. Like the rest of the uncollected items from the bibliography, it was not listed accurately until now. Added the newly discovered letter from Galton, "Dermal Topography", in The American Anthropologist 1, 188: 177. This is one of Galton's earliest published mentions of fingerprints. Added "The Sources of the Nile", Galton's anonymous notice of communications from Speke and Grant, published in the Edinburgh Review CCXLI, July 1863: 105-16. Added the exceptionally rare pamphlet "Catalogue of Models and Specimens [Illustrative of the Arts of Camp Life]" published in 1858. Galton exhibited these models again as part of the 1876 South Kensington Museum Special Loan Collection. Added the newly discovered letter "Organic Stability" in Science New Series 1 (18) May 3, 1895: 482-3. Added the newly discovered article "Useful Anthropometry" in the Proceedings of the American Association for the Advancement of Physical Education 1891. Added the newly discovered review by Galton, "A German Manual of Scientific Enquiry" Nature 11 (278) February 25, 1875: 321-2. Added the pamphlet reprint of Generic Images, which has minor variations, and an autotype plate. Added the pamphlet reprint of Psychometric Experiments. Added the first, second and third editions of The Art of Travel. Added the first edition of Hereditary Genius. Added the fourth and fifth editions of Hints to Travellers. Added a complete facsimile of the first edition of Narrative of an Explorer in Tropical South Africa (1853) with all the colour plates and maps. This is far superior to the second (cheap) edition published by the Minerva Library. Added a facsimile of the exceptionally rare pamphlet by Galton, Anthropometric Laboratory. Notes and Memoirs. [No. 1]. Added complete facsimiles of Vacation Tourists and Notes of Travel in 1861, and Vacation Tourists and Notes of Travel in 1862-3. Added a facsimile of the pamphlet Address to the Anthropological Department of the British Association, Plymouth, 1877. Added Galton's published reminiscences of Herbert Spencer, which should be compared with his MS in Pearson's Life. The site has been moved to a hosting facility with high-speed internet connections. The preferred name is now galton.org. Numerous papers from the Proceedings of the Royal Geographical Society, all of them previously unlisted, have been added. All previously uncollected papers from the French Revue Scientifique have been added in facsimile form. These include some previously unlisted items. Search is now integrated in the left hand corner in the header for all pages. Type the terms and hit enter. Other miscellaneous bibliographical additions and corrections. Turned up another scarce pamphlet, Anthropometric Laboratory: Arranged by Francis Galton. (1884) "Such is the ease of working the instruments that a person can be measured in these respects, and a card containing the results furnished to him, and a duplicate made and preserved for statistical purposes, at a total cost of 3d." Added Galton's exceptionally rare pamphlet Outfit for an Anthropometric Laboratory (1883), which was privately printed. Added contributions by Galton to the (elegantly titled) compendium Katalog Mathematische und Mathematisch-Physikalischer Modelle, Apparate und Instrumente (Van Dyck, Munich: 1892) on the Quincunx, Trace Computer of Vapour Tension, and Pantagraph. These are German translations, prepared by an instrument maker for the Deutsche Mathematiker-Vereinigung, of the currently unobtainable Galton articles in the Reports of the Meteorological Committee of the Royal Society from 1869 onwards. One of the items in this collection was referred to by Pearson, others were not and seem to have slipped notice: all have been omitted from all previous bibliographies. One could infer from the catalog that the Quincunx was commercially manufactured, in Germany at least. Perhaps, slumbering in an attic somewhere in Bavaria ... .
New edition of the rare book Meteorographica (1863) with greatly improved fidelity. Galton had the remaining copies of this book destroyed by Macmillan when he joined the Meteorological Council (according to the Macmillans correspondence with Galton now held in the British Library). Finally tracked down "Rate of Bicycles" in the Field of 1875, incorrectly listed by Forrest (1974) as "Bicycle Speedometer 1877". Forrest clearly relied on the description in Pearson, who gave the date as "about 1877". Added a previously unlisted and rare pamphlet "Brief Notes for Consideration: Skin Sensation" circa 1883. Added the little-known article "Heredity in business merit" from the short-lived, religiously-oriented, Journal of Heredity, 1885, published in Chicago. Added the hard-to-find "Limits of Audible Sound" and "On Means of Combining Various Data in Maps and Diagrams" contributions from Vols. 1 and 2 of the South Kensington Museum's Conferences held in connection with the special loan collection of scientific apparatus, 1876 published in 1877. Added "Measurement of Resemblance" from the Scientific American Supplement of 1906. Added Samuel John Galton's paper on his colour experiments (Monthly Magazine, 1799); Samuel John was Francis' grandfather. Added a book by Emma Galton, Francis's sister: Guide to the Unprotected ... by a Banker's Daughter (Macmillan, 1863). Added remarks made by Galton in the Journal of the Royal Society of Arts on Ostrich Farming in South Africa, (Feb 18, 1876); on "Exploration and the Best Outfit for Such Work" (Mar 13, 1881); and on the teaching of geography (June 16, 1871). Added two newly discovered items from Notes and Queries: a reply by Galton to a question on the Foula (1864); and a query on the Bickerstaffs (1870). Added a long-overlooked and very substantial piece by Galton, published in the St Helena Gazette of January 31 1852: this is the first published description of his explorations of South-West Africa. Added a report from The Reader of 19 September 1863, which has some remarks made by Galton on race. Added profile of Galton from the Strand Magazine of 1897. Added an unlisted interview of Galton by the Pall Mall Gazette of Nov. 16, 1888, about the Anthropometric Laboratory. Added a previously un-noticed reply by Galton in the Notes and Queries of Nov. 14, 1885, to a query on an astronomical paradox. Added interview of Galton by Cassell's Saturday Journal: March 25, 1896. Added "Our National Physique: Prospects of the British Race" a newspaper article by Galton, published in The Daily Chronicle of July 29 1903. Added a newly discovered query on bark vessels by Galton, from the Notes and Queries of Feb 23, 1856. Added a lengthy exchange by Galton, starting with observations on photographic records of pedigree stock, but diverging into a debate with William Housman on the "Ancestral Law", from the Live Stock Journal of 1898. Galton seldom involved himself in exchanges of this sort. Discovered a long-lost piece by Galton, published in Notes and Queries in 1875, on some verses by his grandfather Erasmus Darwin. Galton noticed that they were plagiarized by another poet. Added the version of The First Steps Towards the Domestication of Animals published as a booklet in 1865: the facsimile includes marginal notes and corrections by Galton in his handwriting. Also added the exceptionally hard-to-find exchange in the Homing News and Pigeon Fancier's Journal of 1894 concerning the normal distribution of racing speeds, which suggests that readers of even the most obscure of the Victorian journals were well-read. Activated the galton.org mailing list. Subscribe to get news of site updates and other galtoniana. Added a complete facsimile of Galton's first publication The Telotype (1849) and a facsimile of the original map of Damaraland prepared by Galton. Added German translation of Tropical South Africa, Bericht Eine Forschers in Tropischen Sudafrika. Provided full-text versions of important works on fingerprinting by E. R. Henry, William Herschel, and Henry Faulds. Streamlined look-and-feel. New HTML version of Inquiries into Human Faculty. New HTML version of Hereditary Genius, with latest corrections and decent page numbering and formatting. New section on Galton as Psychologist. Added review of Raymond Fancher's paper on Galton's African Ethnography. Added new bibliography system, with a batch of previously unknown letters to the Times, and other new discoveries. Also added a new Reviews section. Added some missing letters from the Times (many more will be added soon) and other papers, and made the catalogue of the Galton papers searchable. Michael Bulmer's new book on Galton has at last been published. Added full text of Meteorographica and Noteworthy Families. Added numerous scientific papers etc. by Galton not previously published here. Consult the bibliography for details - and note that several previously unknown items have been added to the bibliography. Added first online edition of Record of Family Faculties. Added ability to browse books online, by screen-resolution page image. 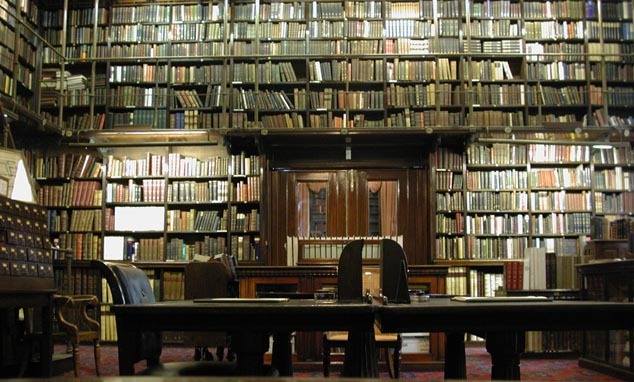 This way books can be read without first downloading the entire high-quality PDF files, which are typically very large. For print-quality, use the PDF files. For example, Pearson's Life can now be browsed by page image. Added a very high-quality facsimile version of Volume 2 of Pearson's Life of Galton. Added very high-quality facsimile versions of Volume 3 and Volume 1 of Pearson's Life of Galton. Added full-text search capability for all of Galton's books. First online electronic edition of Finger Prints and Fingerprint Directories. Added several reviews of Galton's work from the Victorian periodical press.